The win at Blackburn was the talking point all the way down in the car and sometimes you say things you really wish you hadn't. I certainly did that when talking about the previous 2-1 win at Ewood in 1979. On that occasion we also came back from a goal behind at half time when Tony Morley and Brian Hall scored. Neither scored goals for Burnley again and I suggested a strong hope that would not be the case with Jason Shackell and Danny Ings. I did add that Shackell not scoring again would not necessarily be a major problem. "What if Ings gets injured tonight, is ruled out for the rest of the season and is sold in the summer?" I was asked. Mind you, driver Mikey, realising we were in plenty of time, also said: "How about a tour of West Midlands football grounds." Back to that one on the way home. Our game at St. Andrew's was one we should very definitely have won, but we couldn't make it four wins out of four because every time we went in front they went down and equalised. Dean Marney had suddenly become a goalscorer and he netted yet again to give us a half time lead and there appeared to be no real problems until over an hour had gone. Then, substitute Federico Macheda equalised and within another five minutes we'd gone in front again and Birmingham had equalised again. 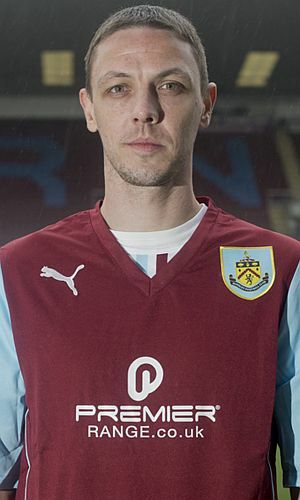 Michael Duff got his only goal of the season to head us back in front before celebrating in front of the travelling Burnley fans but it was all short lived as Emyr Huws, a young loanee from Man City, scored a long range second equaliser. Words were eaten with a quarter of an hour to go as Ashley Barnes replaced the injured Ings, but we really did think we'd won it when Sam Vokes scored with four minutes of normal time remaining. Unfortunately Macheda armed one in four minutes into stoppage time and we had to settle for a point. Then the fun started. Road works forced one detour past Villa Park. We eventually got back onto the M6 and drove past the Bescot Stadium before yet another detour took us on a crawl that led us past Molineux. Which fool suggested a tour of the West Midland's grounds? Finally back on the M6, a quick stop, and then the fog descended. I'm not sure what time I got home but the last of our party, having dropped me off, had to go via Leeds before arriving home in Baildon, West Yorkshire around 5 a.m.
Needless to say some clown phoned me around 7:45 a.m. about PPI so there was a lack of sleep and a lack of patience on the Thursday. By Saturday though I was ready to go. When you are a good team that's dropped points like that, you react. We did, with another three wins. Again we had to come from behind to win, as at Blackburn. This time it was Leeds on the Turf with a Jason Pearce own goal bringing us level before Scott Arfield clinched the win. We followed that up with a trip to Charlton, a free pint in the pub, and the most comprehensive and professional of wins at The Valley. 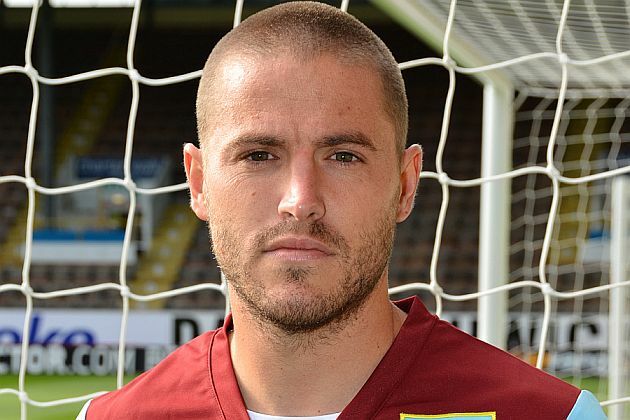 Barnes, who was now in the side for the injured Ings, got his first Burnley goal with Vokes netting a penalty and Michael Kightly completing things at the end with a third. There was even a new signing to see. Dyche had swooped to bring in Chris Baird for the remainder of the season with Kieran Trippier the latest to be ruled out with an injury. This was one of the best days out of the season; I travelled with Yorkshire's Ant and Dec, and my only disappointment was the introduction by Charlton of Ghoochannejhad as a substitute. I was curious as to how he got his name on the back of his shirt but he didn't bother, he just used his first name Reza. He, and Charlton, didn't offer too much of a threat, not even when Marvin Sordell replaced Diego Poyet with 14 minutes to go. Well over 1,800 Clarets there on a day when the singing was simply brilliant, quietening the red, red robin at the other end. The day after this Charlton win I bumped into Brian Flynn. He was with Doncaster then and we were playing them on the Tuesday. I know Flynny well but he had the nerve to tell me that they had a plan and they would end our unbeaten home record. He did add that he believed we would win promotion. I'm not so sure what the Flynn plan was but this Doncaster side looked to be heading in only One Direction and that was down. They were poor, sat off us, never pressed and the 2-0 win was as comfortable as you like with Vokes scoring from the spot in consecutive games and Junior Stanislas getting what proved to be his last Burnley goal. We were ten points clear of QPR now and a massive 13 points ahead of Derby with just eight games to play. It was leaders Leicester next at home. Three points behind with a game in hand, this was simply a must win game if we were to threaten for the title. If it could go wrong, it did go wrong. That was definitely how it was against Leicester. They beat us 2-0 with the inevitable David Nugent goal and one from Chris Wood that should have been disallowed for a foul on Duff. Wood had come on for the injured Jamie Vardy in the first half, but earlier, much earlier in the game, we'd had to replace Vokes. Our replacement was David Edgar and a reshuffle to a side still without Trippier and Ings and now without the suspended Marney. It looked a bad one for Sam, and so it proved when during the next week we heard the dreaded words 'ruptured anterior cruciate ligament'. His season was over. Yes, everything that could go wrong did go wrong, but Leicester were the better side on the day. They were on their way to the title and they looked worthy winners as they ended a home run without defeat that had lasted over a year since Hull won 1-0. It really was a depleted side that turned up at Watford a week later. None of the injured players were back and Marney was still serving the second game of his ban after accruing ten yellow cards. Outside the ground before the game one Burnley fan said to me that if we were Derby or QPR fans we would know we had no chance of catching Burnley, so why, as Burnley fans, were we still nervous of them catching us? We fell behind to a Troy Deeney goal. It was deflected but here we were up against a striker in the Championship valued at around £10 million by his club. We were unfortunate to see a Barnes goal disallowed for offside after a brilliant cross from Keith Treacy but the good news coming through was that neither QPR nor Derby were doing well (both lost their games that day). Our second half performance was good, very good, although Watford might, on two occasions, have grabbed a second, one of them seeing Baird get back to clear off the line. With just four minutes remaining Kightly played the ball from the left to Baird inside. Baird's forward ball found Arfield just outside the box. His turn was sublime and his shot right into the bottom corner for a massive point. There was another huge Burnley following and the away end went crazy. QPR lost at Bournemouth and Middlesbrough beat Derby; we got a point and had stretched the lead. It was just up to us now and a midweek win at Barnsley that saw the return of both Marney and Ings, courtesy of a Barnes goal, left us facing Middlesbrough at home , when Trippier was back, knowing that, should Derby not win, a victory would see us promoted. I don't think anyone knows just how we didn't win this one. The 1-0 defeat was a travesty of a result and I heard one fan say at the end that it was as good as we'd played all season. I can't totally agree with that but I can with the sentiment. As it happened we wouldn't have gone up with a win; Derby beat Huddersfield. The lead was now eight points with four to play. At worst we needed five points. Three of those were on offer at Blackpool on Good Friday. Blackpool on a Bank Holiday is probably not the best of ideas and we were thankful that our departure was early enough to withstand the awful traffic problems that saw us take a route along Strand Road in Preston, along the dock road and then onto the old route from Preston to Blackpool via Lea. Thankfully we were still in time for our traditional seaside lunch before making our way into the super luxury covered Gene Kelly on a day when the biggest threat came from tangerines and tennis balls thrown onto the pitch by the home fans in protest at the owners. This really was a scrappy affair but a superb Kightly goal soon after half time and a miraculous Trippier clearance at the end assured us of the three points. The reaction on the pitch and in the stands at the end of the game left me with the distinct impression that everyone in that ground with a connection to Burnley knew we'd done it. No matter what happened now we needed only two more points. Derby played in the evening at Doncaster. Some of our travelling party to Blackpool had remained in the seaside resort noted for fresh air and fun to enjoy an alcohol fuelled evening. That left me to travel back by coach. Everything was fine until news filtered through that Derby had scored at Doncaster. Two supposed supporters on that coach stunned me. "We won't do it now," said one with the other adding: "I'm worried, I think Derby are going to catch us." I had a less than quiet word with both, smiled to myself and started to think about the Premier League. Blackpool on Good Friday, and a good Friday it was, and now back home to face Wigan on Easter Monday. I had a meeting early season with former chairman Barry Kilby. We spoke about the managerial appointment they'd just made at Wigan and I said I didn't think he'd still be in charge when they arrived at Burnley at Easter. I don't get a lot right but that one I did and by a few months. It proved to be a very special day for the Clarets who ended the game with a 2-0 win and promotion to the Premier League confirmed. It could be so easy to leave it at that, but this was a special performance, more so given the circumstances. Against a strong Wigan side I expected us to be a bit nervy but once again we turned it on, particularly in the first half, with some more inspirational football. Barnes scored the opener midway through the half. If it calmed any nerves they were in the stands because the team played without any worries at all. It really was a wonderful goal with eight of the players, all but three of the back four, involved. The second just before half time from Kightly was a free kick from almost on the left touchline that went straight in at the far post, maybe with the slightest of touches from a defender's head. Wigan weren't coming back in this one. Ings hit the woodwork, Barnes came close, even Mee almost immediately after the second goal was close. It was a performance worthy of the day. Chaos ensued at the final whistle with the players finally coming back out to take a salute from still packed home stands. "We'll go hard," Dyche said on Goals on Sunday the day after, speaking about the two remaining games, and we did just that. Kightly made it three in three with the winner against Ipswich and on the last day both Arfield and Ings scored to earn a 2-2 draw at Reading. Shackell still hasn't scored since Blackburn but thankfully Ings has. We got the medals after the Ipswich game, we paraded on the open top bus on the day after Reading. 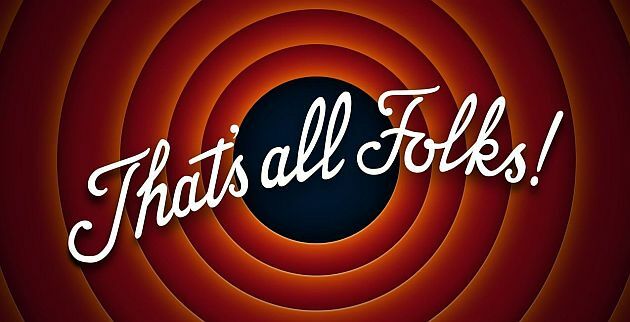 The season was over - that's all folks from season 2013/14, one I am sure we will always remember.